Five students will spend this summer putting their coding skills into practice for openSUSE and other projects during this year’s Google Summer of Code. The international program that matches mentors and students funded 1,315 student projects this year for 201 open source organizations, who will benefit from the active involvement from these new developers. The student proposals selected this year regarding openSUSE mentoring will help not only the openSUSE Project, but multiple other open-source projects like KDE and the Free and Open Source Software Developers’ European Meeting (FOSDEM) as well as many others. In addition to the two student proposals selected for openSUSE’s Open Source Event Management project, which is a self hosted solution to organize conferences, two other students will be developing implementations on OSEM for FOSDEM. Two Linux Kernels per week in openSUSE Tumbleweed is becoming the norm as the rolling release is providing daily snapshots of new software that are closely aligned with upstream development. Kernel 4.9.8 and 4.9.9 were released in the 20170208 and 20170212 snapshots respectively and the later brought a fix for a Btrfs system call. Beside the 4.9.8 Kernel in the first week’s snapshot, 20170208, Mesa users will be happy to see version 13.0.4 had a specfile fix for build configuration for ARM, Power PC and s390 architectures. Gimp 2.8.20 made the color selection of the paint tool more robust and updated translations for a number of European languages. Several other packages were updated in the repositories from this snapshot and python3-kiwi 9.0.2 and vim 8.0.311 provided the most fixes. Snapshot 20170209 brought the first major release of libosinfo (Operating System information database) in Tumbleweed with version 1.0.0, which focuses on metadata about operating systems and provides a single place to manage it in a virtualized environment. F Virtual Window Manager (FVWM) 2.6.7 added a handful of new features and removed several other features like GTK 1.x support. There will be plenty of swag and a specialty German brew from the beer capital of the world at the openSUSE booth to cure your weekend hangover(s). FOSDEM is free and our openSUSE beer is 1€, so there is no excuse not to come see us and talk shop or talk about beer; we have experts in both at our booth. For those of you lucky enough to live near Nuremberg, SUSE are sponsoring a coach bus that will be taking as many as they can from SUSE’s HQ in Nuremberg to Brussels. Most of the people on the bus are staying at the NH City Centre or NH Stephanie hotels, so picking a hotel near there will be most convenient you take the bus. The bus will be leaving *promptly* at 10 a.m. on Friday, Jan. 29, and returning late on Sunday, Jan. 31. (it’s a long drive, but a lot of fun). There are currently 14 seats available,please email Michael Haefner (mhaefner@suse.de) if you’re interested in coming along. 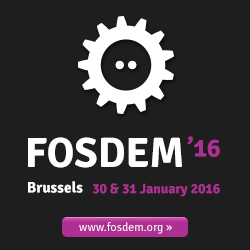 FOSDEM will take place at the first weekend in February (6th/7th) in Brussels and we’re going to attend. There is a buttload of tracks, devrooms and lightning talks to visit. Including, but not limited to: Security, Scalability, Monitoring, Distributions, KDE, GNOME, Ruby on Rails, X.org, LiMux, csync, GeeXboX and so on and so on. You should check the Schedule. Of course also the famous exhibition exhaust pipe hallway will be back once more with project booths ranging from CAcert to Zarafa Community. Our project will attend mostly in the individual project’s devrooms and together with CentOS, Debian, Fedora and Mandriva in the distribution mini-conference that will happen. OfÂ course we also have a booth to show off and hand out promo DVD”s of the greatest distribution on this planet. We hope you seize this opportunity to meet, learn from, get inspired by and shape the community that will gather at the the best Free Software and Open Source event in Europe! This year Juergen and me (tom) went to FOSDEM to do the video recordings of the talks in the openSUSE developer room. Last year we had some problems with the sound quality, so this year we brought some more equipment, amongst others 2 head mics for the speakers, one mic for the audience, an 8 channel mixer and speakers for the audience. I think the result is quite good, both the sound experience in the room and on the recordings. I am sorry for the delay of the recordings, but amongst other distractions my system harddisk decided to die during the video renderings. The recently discovered tool of choice for doing the post-processing is kdenlive which in version 0.7.2 is the best video tool I’ve used on linux. The slides are linked from the FOSDEM09 wiki page, and the recordings are available as .ogg and flash video .